"The translations of comprehensive legal agreements were completed with the utmost quality by Lexiscope." 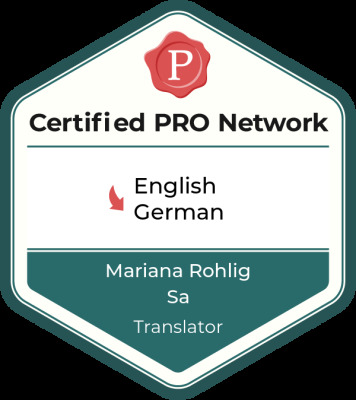 If you are looking for a qualified and experienced translator or interpreter for English, German or Portuguese you have come to the right place. When choosing a translator or interpreter for an assignment it is not only important that they have strong language skills. Deep cultural awareness as well as know-how of the subject are equally important criteria if you want a top-notch translation and spot-on interpretations. Lexiscope, a sole trade language provider run by Mariana Röhlig Sá, ticks all these boxes for a reliable, accurate and prompt service. Whether you need your website and product catalogue in various languages to enter a new market and expand your target audience or require a certified translation of your birth certificate for official use, Lexiscope delivers translations for a variety of sectors, excellence in interpretation for all your event needs as well as proofreading, editing and audio transcription. For further information on the language solutions offered by Lexiscope please browse through the Services menu. I will be happy to discuss any language requests in further detail. Just e-mail me on info@lexiscope.com or call [+351] 938 622 247 and I will aim to answer any queries on the same day. As a translator and interpreter in direct contact with the client I am able to eliminate any middleman fees and offer attractive rates. For a customised, non-obligation quote, please go to the Quote page or e-mail me on info@lexiscope.com.